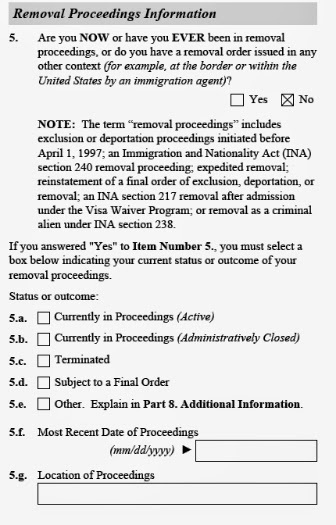 If you must say yes to question 5 on Part 1 of USCIS Form I-821D for initial application or renewal request for Deferred Action for Childhood Arrivals, I strongly recommend that you complete this form with the help of a competent immigration attorney. DO NOT attempt this yourself because it could cause a lot of complications if you make a mistake. That is why for all of you DIY DREAMers I have only shown the answer as No.